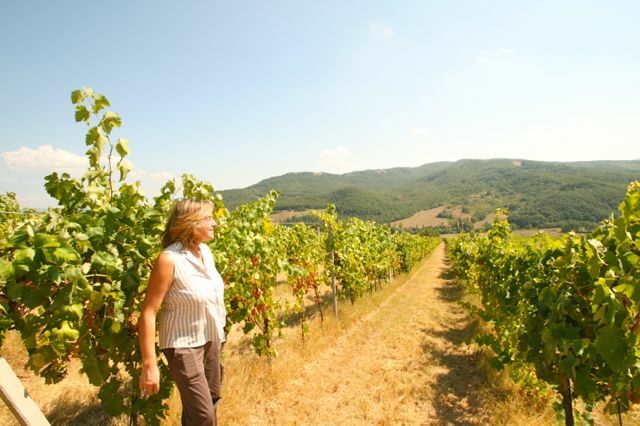 Ursula Gritti is the owner of the only commercial vineyard in the Niccone Valley, I Girasoli di Sant’Andrea. Ursula moved to the Niccone Valley in 1996 with her husband Carlo Massimilliano Gritti. They bought a house called Sant’Andrea located close to the small village of Molino Vitelli. Sant’Andrea came with 180 hectares of land, including a 3 hectare vineyard planted with Sangiovese, Colorino and Merlot dating back to the 1960’s, and some abandoned farm buildings with an old wine cellar. In 1996, with the help of local farmers, they made their first wine in the old cellar using grapes from the vineyard. The resulting wine inspired them to investigate increasing the amount of land devoted to vineyard and to consider going into commercial wine production. In 1997 they planted another 2 hectares with a few rows of Pinot Noir and the rest Sangiovese. 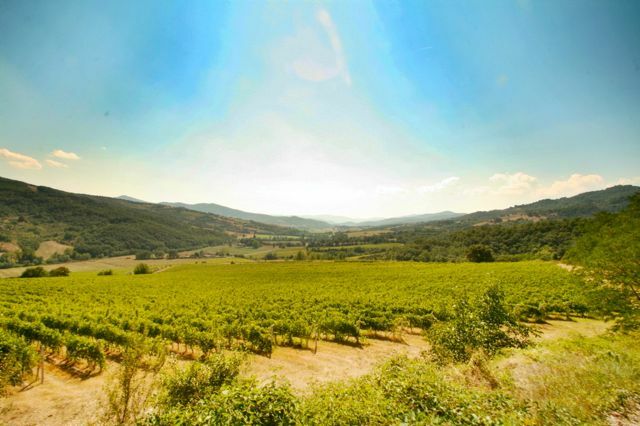 Normally, the climate would be considered too hot for Pinot Noir in this part of Italy, however, it was one of the Gritti’s favourite grapes and so they wanted to try. The resulting Pinot is extremely popular and Ursula probably wishes she had planted more! Between 1998 and 2004, a few hectares of vineyard was planted each year, now there are 39 hectares of vines. There was a restriction on vineyard planting meaning that a quota had to be bought from someone else before a vineyard could be planted. Between 1998 and 2004, the price of the quota rose from €3000/hectare to €11000/hectare, this was before any vines were planted. The business plan was to grow slowly and start making a profit after 6/7 years. Unfortunately, everyone else around the world also had the idea to get into wine production. After the 2007 economic crash it became increasingly difficult to make money as a wine producer. 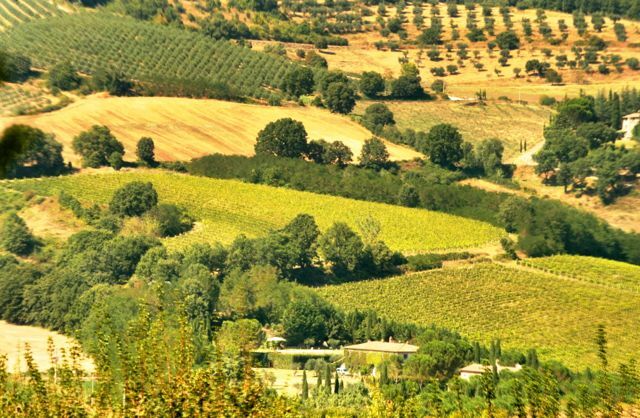 In 2006, Ursula’s husband, Carlo Gritti, died and Ursula struggled to manage the farm which also included a beef farm, 7000 olive trees and 50 hectares of arable land as well as a restaurant above the winery. View towards Ursula’s house and surrounding vineyards. 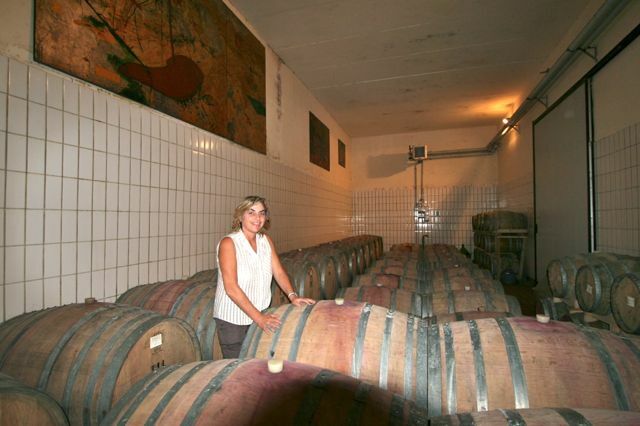 After a couple of years Ursula was able to re-focus her attention on the winery and brought in Riccardo Cottarella and his team in 2009 to oversee wine production. This, combined with the increasing age of the vines, has lead to a jump in quality – putting the Niccone Valley firmly on the wine map. The winery produces around 120000 bottles a year with just over 100000 litres sold as bulk wines. 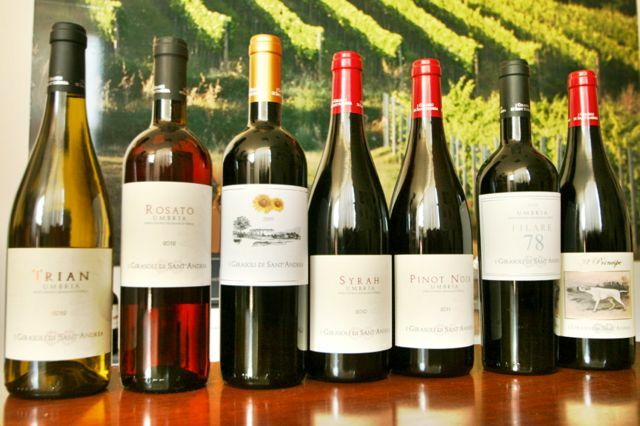 Bulk wine is sold direct to locals who turn up with containers, a lot is also sold as box wine from the winery shop and some is sold direct to other wineries. The bulk wine sales are important for the local market, many of these customers would baulk at buying wine in bottles. The bottled wines are all classified as Umbrian IGT (Indicazione Geografica Tipica). 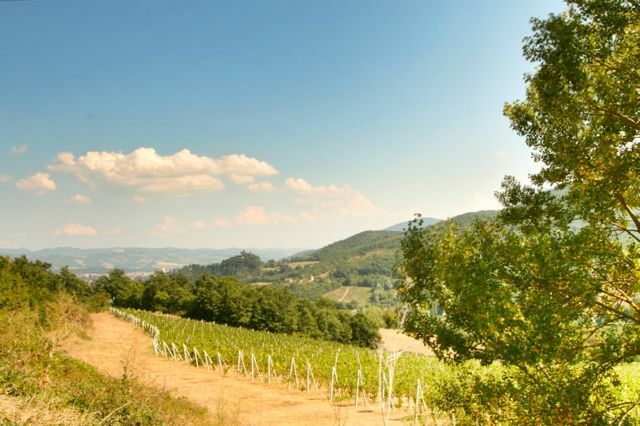 In the Upper Tiber Valley, an area not known for famous wines, most wine makers feel there is not much point following the stricter rules on grape varieties required to label the wine as Colli Altotiberina DOC. They currently range in price from €4.00 per bottle to €15, box wines can be bought for between €9.50 and €11 for 5 litres, less if you bring your own container! Shipping to the rest of Europe can be arranged for €0.5 per bottle if the order is over 36 bottles. You don’t have to come on holiday here to arrange this, simply contact the winery by email. To find the winery shop take the road signed “Migianella” in Molino Vitelli and after a hundred metres turn right through the green metal gate. You may well meet Ursula in the shop. In order to cut costs, much of the work has been mechanised and there are now only two full time employees. In 2011 the beef farm was sold and the restaurant leased by the new owners. This year’s wet spring prevented tractors from entering the vineyards to spray against disease, as a result, only a quarter of the vines will be harvested this year. However, Ursula is optimistic about the future of the vineyard – there is enough wine still in storage to see out next year and, finally, the vineyard has reached financial break-even point. Ursula’s children, Andrea and Pilar, work in the vineyard during school holidays and Andrea, in particular, is interested in taking over the vineyard in the future.